What horror films would you recommend I check out this month? I’m open to all ideas, but I’m most interested in those that may have been overlooked over the years, and preferably ones available on Netflix Instant. Interesting set of films, Eric. I’ve heard of ‘The Woman’, and I might see it, one day. I always recommend ‘The Legend of Hell House’. If you’ve not seen it, it is the 1973 film adaptation of famed sci-fi/fantasy/horror author Richard Matheson’s HELL HOUSE novel. It was directed by John Hough and is available on Netflix streaming. It’s got a marvelous British cast (Clive Revill, Roddy McDowall, Pamela Franklin and Gayle Hunnicutt) and the essence of the story remains intact with the source material. The film remains one of favorite haunted house stories, ever. Niiiice. That’s exactly the type of recommendation I was looking for, Michael. Just added it to the queue — thanks! Argento is someone I have been meaning to get into for a while now. I think I’ll start with Suspiria — thanks Chris! Sorry man, I’m no horror fan so there won’t be any coverage of this genre on my blog at any given month 🙂 I don’t mind if it’s more like Sixth Sense, but generally I just don’t have the nerves for them. Haha no worries, Ruth. I’m not a huge horror buff, but I figure this is the best time of the year to dig into the genre. 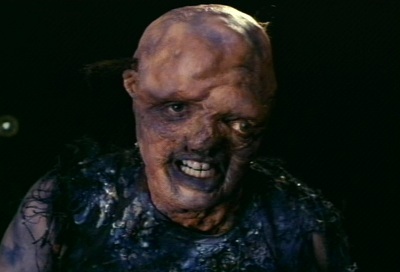 I came out about where you did on The Toxic Avenger, except I was well aware of how intentionally-bad the film is. When it comes to horror, I would suggest Halloween if you haven’t seen it, and of course I’m a big fan of old Vincent Price movies. House on Haunted Hill and The Last Man on Earth are both good watches; so are The Raven and The Comedy of Terrors for lighter fare. Yeah, I knew The Toxic Avenger was going to be bad, it just didn’t have the instant appeal I was hoping for. Didn’t quite live up to its reputation, I guess. I definitely plan on revisiting Halloween this month, as it has been many years since I last saw it. Good call on Vincent Price! I have been meaning to dig into his horror classics, and I know I still have House on Haunted Hill in my queue. I think I’ll catch that first. Thanks, Morgan! 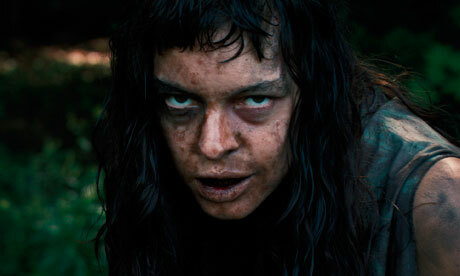 I found The Woman on Peter Hall’s list of best horrors of 2011 at Horror’s Not Dead. That list has served me well. I was completely floored when I saw Fido and found out that the zombie was Billy Connelly. Just took a look at that best of 2011 list. Seems like I need to see The Innkeepers soon. I think I have been hesitant since I didn’t enjoy Ti West’s other film, The House of the Devil, at all. But the praise for The Innkeepers does seem pretty consistent. Not seen or heard of any of these! As for recs for horrors this season I’d say 30 Days of Night, Triangle, REC, The Orphanage – a few different sorts of horrors there. Hope you haven’t seen any of them. Big fan of the first [REC]. That ending was just batshit crazy. Forgot all about The Orphanage! That has been on my to-see list for a while now. I’ll have to look up the other two as well. Thanks, Jaina! I loved, loved, loved Fido, but it definitely errs more on the side of comedy than horror despite the zombie element and some grisly deaths. I’d recommend it to anybody, but for horror aficionados, it’s a little bit light on the horror. As for The Woman, I haven’t seen it and I’m not sure when I’ll have the opportunity to, but the Sundance controversy alone has me itching to watch it whenever I’m able. I don’t have much to say about The Toxic Avenger. I’m a fan, but it’s also Troma, and Troma films are scrappy D.I.Y. acquired tastes. It’s kind of hard to bring myself to argue its case. For recommendations– start with Carnival of Souls and Penumbra. Very different, but I’ve watched (in the case of the former, re-watched) both of them recently and enjoyed them both immensely. You’ll have to get past Carnival‘s less-recommendable technical merits– bad sound mixing and some bad performances– but if you do you’ll be rewarded with a really eerie, haunting story. As for Penumbra, the story goes from dark comic stuff to a much more giallo-ish payoff by the end. Very solid. Curious if anyone here has seen Lovely Molly. I’m trying to find time to check it out myself, but I’m hearing good-to-mixed things about it. I wanted to love Fido — it sounded like something right up my alley — but it felt too “safe” for me, if that makes sense. It missed having that extra something to make it a bona fide cult hit. The Woman is well worth seeing, but it is ultimately a “love it” or “hate it” film. Curious what your take would be. I actually saw Carnival of Souls last month. I loved the haunting atmosphere, but had a hard time getting into the film. Can definitely see its influence over the years, though. I’ll have to look up Penumbra and Lovely Molly. Thanks for the recs! I don’t actually disagree about Fido being “safe”, but only in the sense that what it’s subverting is a culture that we’ve more or less developed beyond. “Leave it to Beaver with zombies” as a premise would be much more biting in the right time period, whereas now I think it’s mostly just satire of a time long passed. For me, that works, and if nothing else I like seeing zombies in this context. I answered my own question regarding The Woman: it’s on Netflix. I’ll check it out soonish! Oh yeah, I got a huge kick out of the Leave it to Beaver setting (and the Lassie references), no doubt. The environment/time period was one thing I felt the film really nailed. I’ll keep an eye out for a review of The Woman from you. Hope you enjoy it.